Federal health reform has decreased the number of uninsured Americans and charity cases at hospitals, it has also led to an increase in the number of high deductibles they can't collect, a particular problem in rural areas where hospitals are already struggling financially, John Lauerman reports for Bloomberg Business. The nation's uninsured rate has dropped from 15.7 percent in 2009 to 9.1 percent today. That would be good news if a Centers for Disease Control and Prevention survey hadn't revealed "that in the first nine months of 2015, about 36 percent of the U.S. insured were covered by high-deductible or consumer-directed health plans that can require considerable out-of-pocket payments, compared with about 25 percent in 2010," Lauerman writes. As a result, companies like Community Health Systems Inc., which "operates 195 hospitals in 29 states and is the U.S.’s second-biggest for-profit U.S. hospital chain." earlier this month "revised its fourth-quarter 2015 provision for bad debt up by $169 million—and said that 40 percent, or about $68 million of that amount, was from patients being unable to pay deductibles and co-payments." "Patients are unlikely to pay medical bills that are greater than 5 percent of household income, according to the Advisory Board, a consulting firm to hospitals," Lauerman writes. "Median household income in the U.S. is at about $53,000, suggesting that when out-of-pocket charges exceed $2,600 hospitals can forget about collecting," said Washington-based analyst Spencer Perlman. In Central Appalachian coal country that is predominantly Christian a growing Muslim population has emerged that has been largely welcomed and embraced by communities such as Pike and Floyd counties in far Eastern Kentucky, Kevin Williams reports for Al-jazeera America. 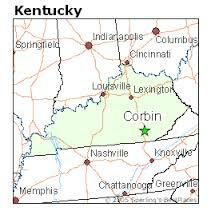 "With its coal-caked hills, isolation and deep poverty, southeastern Kentucky is probably not the first place that springs to mind when one considers the Muslim experience in America. 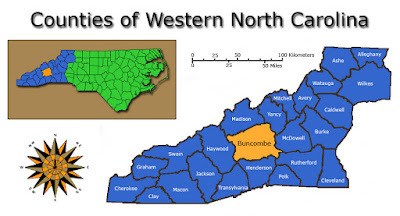 But nonetheless, a small Muslim community has settled in the Appalachians, making a home forged in the ash-black-smudged margins. 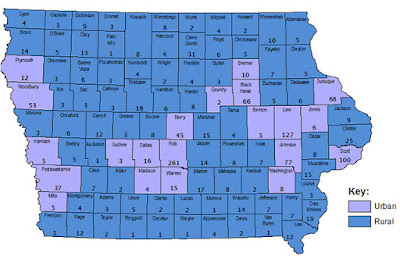 Friendships are made and communities are established, even as a wider debate rages around the prejudice of GOP frontrunner Donald Trump’s call for a ban on Muslims immigrating to the U.S."
Mitchell County's closings are largely blamed on "a shifting economy and the loss of jobs in textiles and furniture contributed to the changing demographics that mean fewer children in county schools," Ball writes. Rick Spurling, Mitchell County's superintendent, said he expects there to be more restructuring in the future, with enrollment projected to continue to fall. Spurling said in 1983 district enrollment was about 3,400 to 3,500, but has now fallen to 1,900. He said the district loses about 45 students per year, which amounts to losses of $300,000. 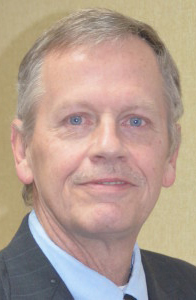 Kenneth Little, staff writer for the daily Greeneville Sun in East Tennessee, won the 2016 Public Notice Journalism Prize for coverage of a Limsetone nursing home that saw its Medicare/ Medicaid coverage revoked by the federal Centers for Medicare and Medicaid Services. Carol Pierce reports for the Public Notice Research Center that the story, published in December, "followed publication of an official newspaper notice by HHS in the Sun noting 'deficiencies' by the hospital. ... The public notice advised readers that Medicare/Medicaid coverage would cease as of Nov. 28, 2015." Little will be presented the award March 17 by the Public Notice Resource Center at the National Newspaper Association’s Community Newspaper Leadership Summit in Washington. "Bradley L. Thompson II, president of the Public Notice Resource Center, said judges found Little’s coverage compelling and important to readers," Pierce writes. "The story noted shortcomings of the John M. Reed Health and Rehabilitation Nursing home cited by HHS. Among them were a report from a housekeeper who said she had checked a patient’s vital signs one night because of a shortage of nursing staff, a failure to maintain antibiotics ordered by physicians, and failure to prevent pressure sores." To read the winning story click here. While many states have tried to address teacher shortages—especially in rural areas—by paying off new teachers' student loans, recruiting rural high school students into education programs or promoting the quality of life in a rural community, the problem of low pay persists in many areas. 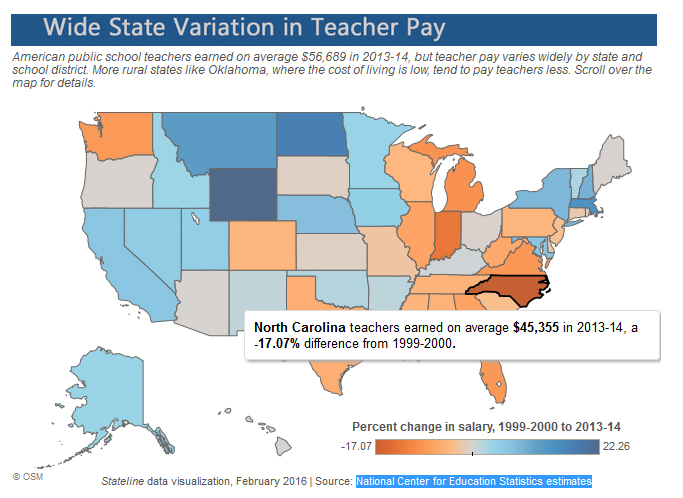 In 28 states, including most of the South, teacher pay decreased from 1999-2000 to 2013-14, according to data Stateline took from National Center for Education Statistics estimates. Some states, like New Mexico, Oklahoma, South Dakota and Washington have called for statewide teacher raises, Quinton writes. But low pay is not the only factor. "Teacher shortages involve many factors, including teacher retirements, a growing school-age population and efforts to reduce class sizes. Educators, advocates and researchers nationwide have different theories about why schools may have trouble recruiting qualified teachers." A new computer application can help journalists verify data they collect and assemble. Dataproofer, created by online news outlet Vocativ, "allows users to easily spot if their data sets are high-quality, accurate or have misinformation," Adreana Young reports for Editor & Publisher. "Dataproofer works like spell check for spreadsheets, said Gerald Rich, creator of Dataproofer and interactive producer with Vocativ. Simply input your data into a spreadsheet, drag and drop the spreadsheet into the app, and it searches for and highlights duplicated rows, missing column headers, bad URLs, incorrect geo-data—such as incorrect longitude and latitude for locations—a value that is too high and more." Dataproofer, which received a $35,000 grant from the John S. and James L. Knight Foundation's Prototype Fund, "allows reporters to look at the data critically and decide whether it’s good to go or if more reporting is necessary," Young writes. "It also allows for more accurate and quicker fact checking than a reporter or editor could do alone." "Maple syrup traditionally has been produced on land that’s not particularly well suited to other crops," Kallner writes. "It’s hard to raise corn and soybeans in the stony, sandy soil of northern Wisconsin, or the steep slopes of New England. But we have lots of maple trees. Managing a healthy forest to produce an annual yield has long been part of how farm families make do." Small producers often use syrup sales to pay land taxes, "so when you patronize a roadside stand selling home-grown syrup, you’re also supporting the local school, fire department, ambulance service, roads, and all the other things funded by property taxes," she writes. It's not a hobby, but most producers should not expect to get rich off producing maple syrup—for about 80 percent of syrup producers, less than 25 percent of total household income comes from farming. 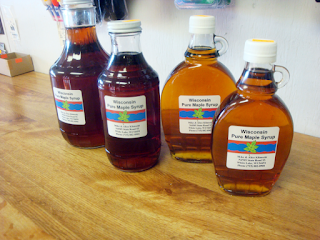 Producing maple syrup is hard work, but it's a local food and it's nutritious. "The higher the concentration of sugar in the sap, the less water that needs to be evaporated to make syrup—which means less boiling time and, for want of a better term, a 'fresher' flavor," she writes. "I’ve had great dark syrup infused with the smoky flavor of the wood fire used under the evaporator, and not-so-great syrups with sour, burnt and other 'off' notes. But in my opinion, nothing beats the flavor of the syrup made next door... Call me sappy, but I prefer my syrup light and sweet and buckets at my feet on a muddy trail through a snowy woods. But you do what you have to to pay the taxes." Maple producer and journalist Steve Taylor, a former New Hampshire agriculture commissioner and Rural Blog correspondent, says Kallner's story is "a good explainer for the lay audience. Bigger concerns hanging over the industry are the weak Canadian dollar, which is attracting much cheaper syrup from the Quebec cartel into the U.S. wholesale market and has knocked 10-15 percent off the historic highs of a couple of years ago for bulk ('barrel') syrup, plus what some of us fear is over-expansion down here, especially in Vermont where seems like everybody has doubled tap numbers in the past five years and could be heading us onto the path of dairy where there’s too much milk pressing prices downward. We shall see." A decline in Central Appalachian coal production has reduced severance taxes in Kentucky and has coal officials in West Virgina asking for a reduction of the severance tax there. Kentucky officials in Kentucky say the fall in severance taxes has negatively impacted coal counties, and West Virginia officials expressed fear that the same will happen in the Mountain State. Coal-county judge-executives in Kentucky told the House budget committee this week that a reduction in severance-tax dollars going to the state, half of which is rebated to counties according to production, is stretching already tight state and local budgets even further, Anna Bauman reports for the Kentucky Center for Economic Policy. "In 2015, coal severance tax receipts were just 62 percent of what they were at their peak in 2009, and the forecast for the biennium estimates that in 2018, they’ll be down $185 million from 2009 receipts." Officials said "the consequences of declining funds have included: Layoffs and bans on overtime; shuttered community centers and recycling centers; higher sanitation bills and 911 fees; drastically reduced meals to senior citizens; and federal dollars left on the table due to constrained local funds," Bauman writes. The judges testified that "too little revenue will jeopardize their ability to fulfill state-mandated duties including sanitation, parks, county jails, animal control and fire and rescue." Kentucky has seen coal production drop 54 percent since 2011, according to the Department of Energy Development and Independence. A study commissioned by the West Virginia Coal Association said "slashing the state’s coal severance tax from 5 percent to 2 percent would save 1,864 jobs," Daniel Tyson reports for The Register Herald in Beckley. "Those numbers include 464 direct coal mining jobs, 345 direct transportation jobs, 490 jobs indirectly in the supply industry and 565 induced jobs created by household spending of wages. ... The report also states the reduction in severance taxes would bring state mining production numbers up to 2013 levels, about $362 million of additional coal output." "The West Virginia Department of Revenue estimates a 3 percent reduction would ax in excess of $100 million annually from the state’s coffers," Tyson writes. "That is not feasible at a time when the West Virginia is facing a budget shortfall of more than $350 million. Lalena Price, communication’s director for the department, told Tyson, “At a time when the state is already dealing with financial difficulties, that’s not something we’re able to consider at this time." Local officials were more blunt, saying a reduction of severance taxes would be devastating to the economic outlook. Tired of trying to read a scientific research paper and getting stuck staring at a costly paywall? 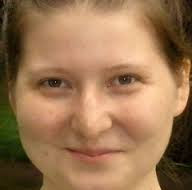 Kazakhstani neuroscientist Alexandra Elbakyan, who said she was frustrated that her own research was being stymied by fees that she could not afford, has been dubbed the "Robin Hood of Science" for creating a website called Science Hub that makes "almost every single peer-reviewed paper ever published freely available online," Fiona MacDonald reports for Science Alert. Elbakyan is fighting a ruling last year by a New York district court to take down the site, "triggering a debate over who really owns science." Elbakyan told MacDonald, "Payment of $32 is just insane when you need to skim or read tens or hundreds of these papers to do research. I obtained these papers by pirating them. Everyone should have access to knowledge regardless of their income or affiliation. And that’s absolutely legal." Science Hub "works in two stages," MacDonald writes. "First of all when you search for a paper, Sci-Hub tries to immediately download it from fellow pirate database LibGen. If that doesn't work, Sci-Hub is able to bypass journal paywalls thanks to a range of access keys that have been donated by anonymous academics. This means that Sci-Hub can instantly access any paper published by the big guys, including JSTOR, Springer, Sage, and Elsevier, and deliver it to you for free within seconds. The site then automatically sends a copy of that paper to LibGen, to help share the love." While Elsevier is suing Elbakyan for "irreparable harm," she claims the research should be protected under the United Nations Declaration of Human Rights, "which states that 'everyone has the right freely to participate in the cultural life of the community, to enjoy the arts and to share in scientific advancement and its benefits'," MacDonald writes. She also said academic publishing differs from the film or music industries, where pirating steals from creators: "All papers on their website are written by researchers, and researchers do not receive money from what Elsevier collects. That is very different from the music or movie industry, where creators receive money from each copy sold." "But bankers are worried about the potential of loan defaults as incomes fall, prompting farmers to take on more debt," Huffstutter and Madden write. 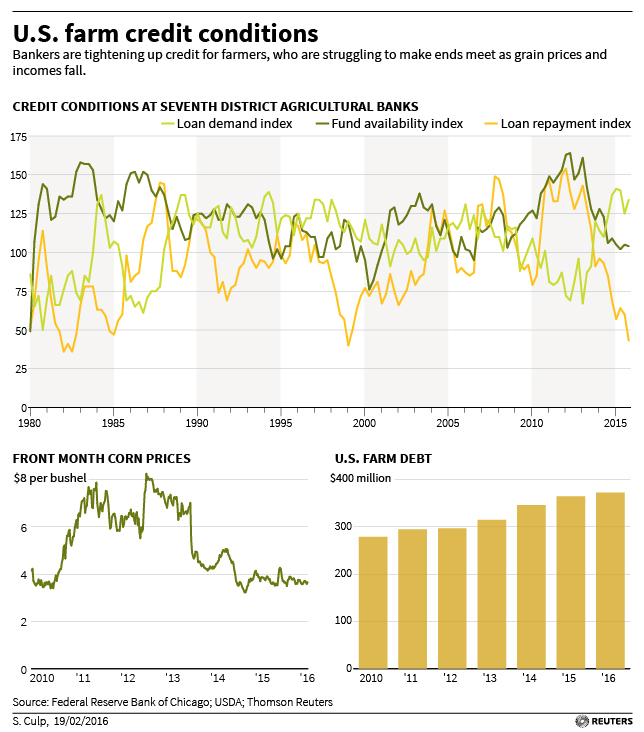 "U.S. farm debt, adjusted for inflation, is now at the highest levels since the nation's agricultural crisis in the 1980s, when scores of rural banks failed. 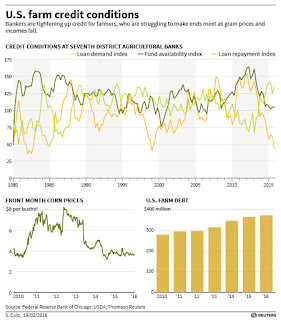 Tightening credit sends a clear message: the hard times are here to stay, and sacrifices are in order to avoid a future of forced land sales, farm equipment repossession and bankruptcies." "Customers with grain in their bins are being steered toward government-backed loans where the taxpayer would shoulder some of the risk," Huffstutter and Madden write. "The number of these marketing assistance loans from the U.S. Department of Agriculture—short-term credit backed by crops—rose to over 47,500 with $5.7 billion dispersed in 2015, up over 50 percent from when the downturn began in 2013, according to USDA data." "The squeeze comes as most farmland rent payments—which can run into millions of dollars—are due March 1. Seasonal payment deadlines also loom for seeds, chemicals and equipment," Huffstutter and Madden write. "The crunch could also deepen the pain felt by input suppliers, grain buyers and equipment manufacturers. On Friday, Deere & Co. further cut its sales and profit outlook and said it now expected farming and construction equipment sales to fall 10 percent for the year ending in October." The Poynter Institute's News University will hold a timely webinar at 2 p.m. EST Thursday: "How to Fact-Check Politics and the Media: A Primer." The webinar is designed not only for reporters and editors, but for non-journalists "who would like to introduce or promote fact-checking within your local or national media context" and news junkies "concerned with the accuracy of the content you are consuming" from "publications prioritizing traffic and clickbait over accuracy and ethics," NewsU says in its description. The cost of the webinar is $29.95. In our experience, NewsU webinars are worth the money, and fact checking is needed more than ever, so we encourage you to enroll by clicking here. If you are unable to participate from 2 to 3 EST tomorrow, your registration will give you access to the archived webinar. NewsU is funded by the John S. and James L. Knight Foundation. A growing number of rural hospitals are closing labor and delivery units, making transportation difficult for the roughly 500,000 women that give birth at rural hospitals each year, Michelle Andrews reports for Kaiser Health News. A study by the University of Minnesota School of Public Health, published in January in the journal Health Services Research, looked at 306 rural hospitals with at least 10 births in 2010 in nine states—Colorado, Iowa, Kentucky, New York, North Carolina, Oregon, Vermont, Washington, and Wisconsin. It found that 7.2 percent of those hospitals closed their obstetric units. Andrews writes, "There are many factors that contribute to the decline in rural hospital obstetrics services. For one thing, obstetrics units are expensive to operate, and a small rural hospital may deliver fewer than 100 babies a year. It can be difficult to staff the units as well. Small rural hospitals may not have obstetricians on staff and rely instead on local family physicians, but it can be difficult to get enough to fully provide services for a hospital, too. 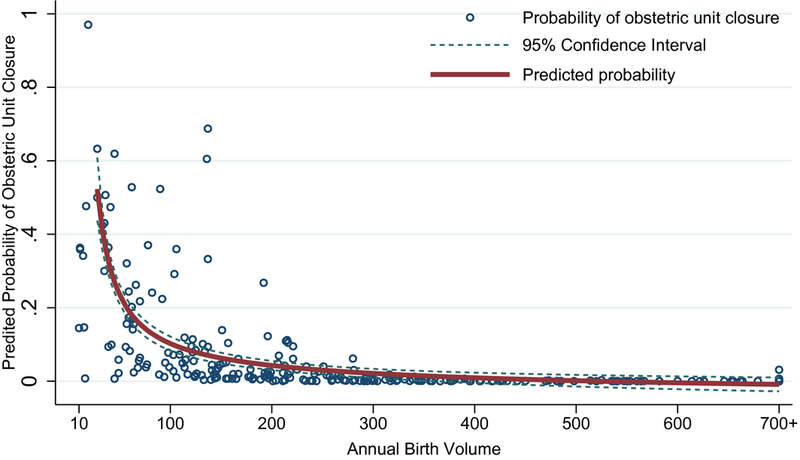 Nurses with obstetrics experience also can be scarce." Paying for such services is a big issue because of meager insurance payments and Medicaid reimbursements, which are about half as much as private insurance. "Medicaid pays for slightly under half of all births in the U.S., but in rural areas the proportion is often higher," said study author Katy Kozhimannil. "Keeping a labor and delivery unit open is harder in rural areas." 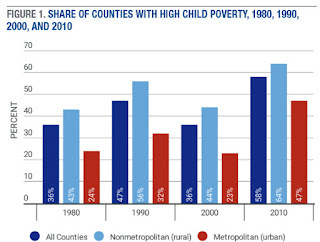 "Only 14.3 percent of the total child population resides in a rural county, but these counties contain 17.2 percent of the nation’s poor children," states the report. 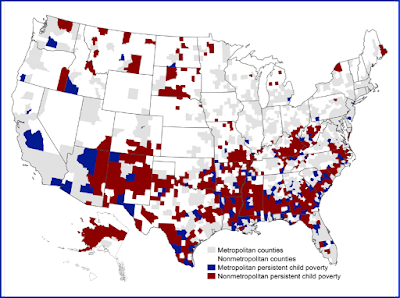 "More than three-quarters of counties with persistent high child poverty have a substantial minority child population. 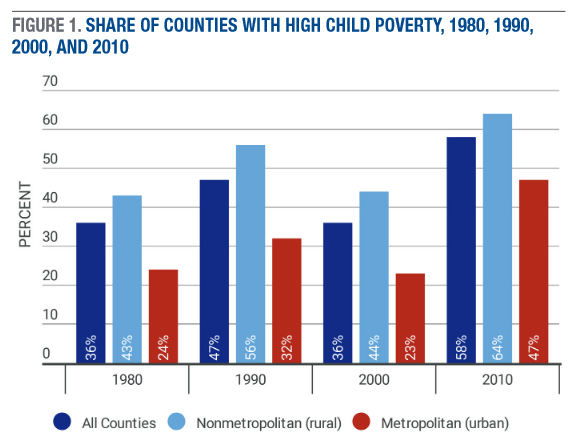 Child poverty rates are dramatically lower for non-Hispanic white than for minority children regardless of the racial-ethnic composition of the county in which they live." "National employment in oil and gas extraction is at its lowest level since February 2012, down nearly 9 percent from the peak levels enjoyed in 2014, according to the Bureau of Labor Statistics," Gray writes. At the same time some areas have seen a 30 to 35 percent increase in thefts of equipment over the past two years, said Russell Winn, an account executive with a brokerage firm closely involved with the oil and gas industry. "Values of stolen items vary, but one truckload of drill pipe can be worth $100,000, while pilfered scrap metal from a single worksite can fetch more than $10,000," Gray writes. 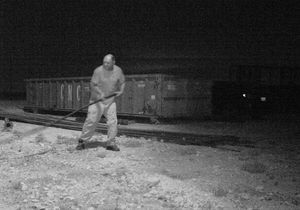 "Last April, seven drill bits worth $267,000 were reported stolen from a site in Weld County, Colorado. All that theft adds up to tens of millions of dollars lost annually. Some sources indicate that value can even soar into the billions. In Texas alone, the Energy Security Council estimated that 1 to 3 percent of the state’s 700 million barrels of oil production was stolen in 2013. The problem is simple: Unattended and out-of-service oil wells are easy targets for thieves." In a talk at the Harvard University's Kennedy School of Govrnment, Mele said, "Although some news organizations are seeing the largest online audiences they have ever had, revenue is still shrinking... Print advertising still generates the vast majority of newspaper revenue—an undesirable situation, given the cost of printing," Nilagia McCoy reports for Journalist's Resource, a service of the school's Shorenstein Center on Media, Politics and Public Policy. “Part of the challenge is an over-reliance on paywalls—people think you put up a wall, and that’s how you’re going to force people to pay," he said. "I think that building a subscription base is a lot more about engaging people in a variety of channels. ... Paywalls also hurt digital distribution on platforms such as Google and Facebook." About five million students who lack Internet service at home—many of them in rural areas—are struggling to keep up with a growing trend in education to rely on resources from the Internet for class work, Ilana Panich-Linsman reports for The New York Times. In some rural areas students go to extremes to get connected, depending on "school buses that have free Wi-Fi to complete their homework. The buses are sometimes parked in residential neighborhoods overnight so that children can connect and continue studying." In other places, children head to free Wi-Fi hotspots, such as libraries and fast-food restaurants. Poverty-stricken rural South Texas has one of the lowest Internet access rates in the country, with as many as 40 percent of households having no Internet access, Panich-Linsman writes. 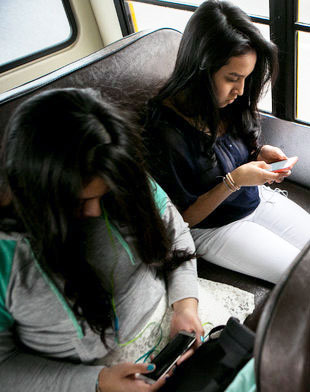 The South Texas Independent School District has put Wi-Fi on more than 100 school buses to help students who do not have access at home, leading some students to take longer bus rides home—sometimes lasting several hours—to finish homework. "In McAllen Independent School District, which has 33 schools and 25,000 students, each location runs wireless hot spots 24 hours a day so that students can sit in parking lots or crouch against school walls to do homework into the night." Help could be on the way. Members of the Federal Communications Commission are expected to vote next month on re-purposing the $2 billion-a-year Lifeline phone subsidy program to give low-income households the option to apply the subsidy to broadband Internet access, either wired or wireless. Lifeline is different from the E-Rate program, which helps schools and public libraries pay for Internet service. Jessica Rosenworcel, a Democratic member of the FCC who has pushed to overhaul the Lifeline program, said "seven in 10 teachers now assign homework that requires web access," Panich-Linsman writes. "Yet one-third of kindergartners through 12th graders in the U.S., from low-income and rural households, are unable to go online from home. The Obama administration announced in July its own program to help address the problem, deploying free and affordable broadband into public housing." "The Lifeline plan has drawn strong criticism from the two Republicans among the five FCC commissioners, and from some lawmakers, who say the program, which was introduced in 1985 to bring phone services to low-income families, has been wasteful and was abused," Panich-Linsman writes. "In 2008, when the commission added subsidies for mobile-phone services to discounts for landlines, some homes started double-billing the program, and the budget for the fund ballooned. Various investigations, including a government review in early 2015, questioned the effectiveness of the phone program and whether the commission had done enough to monitor for abuse. But advocacy groups for children and minorities have backed the FCC plan, saying it will be important in preventing students from falling further behind their peers." Kelley Drye, an international law firm, is hosting a webinar from noon to 1 p.m. (EST) on Wednesday that will examine federal Universal Service Fund activities, including changes in the Lifeline program. For more information or to register for the event click here. "Cruz’s plan to restore ownership of a massive amount of federally owned land in Nevada to the state’s citizens is in stark contrast with rival candidate Donald Trump’s proposals," Mindock writes. "Unlike Cruz—and Florida Sen. Marco Rubio—the billionaire has said he doesn’t trust states to manage their land responsibly. The strategy to pull in rural caucus participants who are passionate about this issue could narrow a polling gap and help Cruz beat Rubio—and perhaps even Trump." "Land rights issues are particularly important to Nevadans—especially in northern counties—because of the sheer percentage of the state that is owned by the federal government," Mindock writes. "At 84.9 percent of the total land area, Nevada has more of its land owned by the national government than any other state. 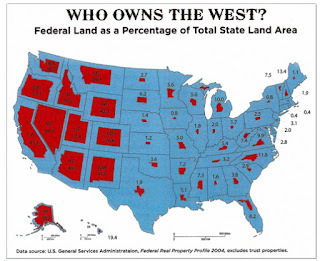 Critics of that level of ownership say the federal government wields outsized power in state affairs and cuts out the potential economic benefits that could come with opening up land to private investment and economic development, such as with expanded mining or logging in the state." The Center for Environmental Health is hosting a webinar, "Community and Psychosocial Effects of Oil & Gas Development" Feb. 29 from 2 to 3:30 p.m. EST. The webinar, the first in a series, will consist of three talks: "An Overview of Community Impacts" will focus on the range of impacts experienced by communities and individuals near areas of oil and gas extraction; "Changes to Social & Community Norms" will provide an overview of place-based collaborative ethnography as an applied social science practice and community health assessment tool for understanding the psycho-social impacts of unconventional oil and gas development; and "Health Concerns From the Community Perspective" will describe the findings of focus group interviews regarding health concerns of community members living in a county in northeastern Pennsylvania that is undergoing the industrialization of unconventional natural gas development. Follow-up webinars will be held March 7 ("Clinicians’ Perspectives: Symptoms, & Approaches to Diagnosing and Treatment") and March 14 ("Researchers’ Perspectives: community research and data to inform policy outcomes.") For more information or to register for the webinars click here. "Reducing U.S. climate emissions enough to avoid a 2-degree Celsius increase in global warming could prevent up to 175,000 pollution-related premature deaths nationwide by 2030 and generate health benefits of about $250 billion annually," says a study by Duke University and the NASA Goddard Institute for Space Studies published in Nature Climate Change. "Most recent climate negotiations have focused on reducing current levels of emissions enough to avoid triggering a 2-degree Celsius (or 3.6-degree Fahrenheit) rise in atmospheric warming—a threshold at which the increased risk of prolonged droughts and heat waves, accelerated sea-level rise and other damaging climate impacts could outpace our ability to adapt," Tim Lucas reports for Duke Today. "Much of these negotiations have centered on reducing emissions of longer-lived greenhouse gases such as carbon dioxide. But the study demonstrates that simultaneously reducing other air pollutants also has benefits." Researchers found that "cleaner energy policies could prevent as many as 175,000 premature deaths, and another 22,000 or so deaths each year following that," Lucas writes. "Cleaner transportation policies could prevent around 120,000 premature deaths by 2030, and another 14,000 or so deaths each year thereafter. The nationwide health benefits associated with preventing these deaths would total around $250 billion a year in the near term. That means they would likely exceed what it costs to implement the new policies and would offset damage recovery fees or avoidance credits for businesses that are negatively affected." Some of the more than 20,000 unaccompanied minors that last year fled violence and poverty in Central America to seek a brighter future in the U.S. have been placed in rural areas, Esther Honig reports for Harvest Public Media. Many unaccompanied minors end up in meatpacking towns, like Liberal, Kan. (Best Places map), where 60 percent of the 4,000 residents are Latino. "In the last two years, Ford and Seward counties in Kansas have received a total of 156 unaccompanied minors—more than any other region in the state. That's because they were placed with relatives that had previously moved to the area to work at National Beef." Diego, a 17-year-old who left Guatemala to escape poverty and seek a better education and a better paying job in the U.S., told Honig, “In Guatemala, you know, it’s a poor place. There’s isn’t money for food, we don’t have a lot and I don’t have a dad.” Honig writes, "A smuggler was hired to bring Diego from Guatemala up through Mexico, but when he tried to cross the border into the U.S. he was apprehended by Border Patrol. Like the other unaccompanied minors caught illegally entering the country, Diego was briefly detained and then placed in federal custody. He spent about a month living at a shelter in Texas where the U.S. Department of Health and Human Services confirmed his identity and assessed his health. The Office of Refugee Resettlement brought Diego to a family member in Kansas, someone who would agree to take care of him until his mandatory court hearing with immigration. That’s how Diego wound up in Liberal—his half-brother has lived there for years." "These young immigrants are designated 'unaccompanied alien children' by the federal government and can remain in the country until their immigration status hearing," Honig writes. "Some may choose to claim asylum, but many more will apply for Special Immigration Juvenile Status, available if a minor has been neglected, abused or abandoned by their parents. If granted, the status allows a young immigrant to remain in the U.S. Diego is still waiting for his court date; due to the large influx of these cases, many immigration courts in the U.S. are backed up. In the meantime, Diego is not allowed to work legally, but he can attend school. He is enrolled at the local high school, something he says his family couldn’t afford to do back in Guatemala." "Unaccompanied minors like Diego are not provided with a lawyer when they appear in immigration court," Honig writes. "That means they may pay as much as $6,000 for representation. Research by the advocacy group Kids In Need Of Defense shows that the success rate for gaining legal status is five times higher when the minor has professional representation. In Liberal there are only five immigration lawyers and they offer limited pro bono work." One problem is that unaccompanied minors are often placed with family members they barely know, or have never met at all, which leads to neglect, abuse and sometimes human trafficking, Honig writes. "A recent U.S. Senate investigation discovered that this is a national issue. Overwhelmed by a large and unexpected influx of unaccompanied minors, the federal Office of Refugee Resettlement failed to conduct basic background checks on the adults entrusted with caring for these youth, according to an investigation by The Associated Press." A lack of fire hydrants is hampering local firefighters in rural Caldwell, Idaho (Best Places map), where they have a coverage area of 135 square miles and receive 5,000 calls per year, one-third of them to areas without a hydrant, Ruth Brown reports for the Idaho Press-Tribune. A December fire at a goat farm destroyed a milk parlor, processing room and milk tank, causing $500,000 in damage—not including money lost while operations were shut down—despite at least five agencies responding to the blaze. Caldwell Fire Department chief Bud Bryson said each engine "that responds to a scene can carry about 500 to 1,000 gallons of water," Brown writes. "If a water tender is brought, it carries another 1,500 to 3,500 gallons of water. Additionally, Caldwell fire crews carry compressed air foam, which is used in extinguishing fires when the blanket of foam put on the fire serves in heat absorption." The foam "can have about five times more extinguishing power than water." Fire officials recommend that homeowners "set up a rural water supply, such as a connection to a pool that firefighters can take water from." Also, those constructing homes in rural areas should build residential fire sprinklers that are "are built into the home and dispense water when heat is detected." Donald Trump scored big in rural areas in South Carolina's Republican presidential primary Saturday, while Sen. Bernie Sanders narrowly beat Hillary Clinton in rural areas in Nevada's caucus the same day, Bill Bishop and Tim Marema report for the Daily Yonder. 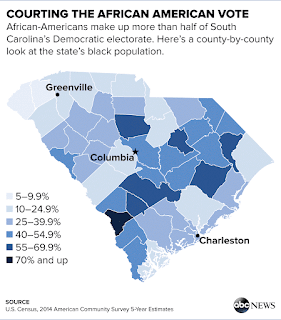 Trump won all 50 of South Carolina's delegates with 33 percent of the vote, while Clinton took Nevada 53-47. More than 3,000 rural residents will no longer receive delivery of Utah's largest newspapers, Tony Semerad reports for The Salt Lake Tribune. Following a national cost-cutting trend that has been going on for 40 years but has escalated in the past decade, the Utah Media Group said the Tribune and the Deseret News "no longer will be transported to homes, stores and sidewalk racks in southeastern Utah's Kane, Grand and San Juan counties (outlined in red on emendated Pioneer map). Those readers, instead, will be given three months of free access to ... the e-edition, a version of the paper that duplicates the print edition in static digital form and is made accessible via the Internet." 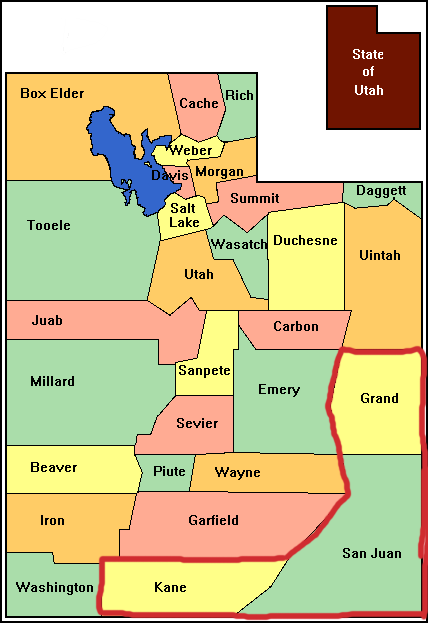 "Subscribers in 13 other counties off the Wasatch Front will still get home-delivered print newspapers Friday, Saturday and Sunday, but they will be asked to convert to the digital version the rest of the week," Semerad writes. "Rural counties retaining weekend print delivery are Beaver, Daggett, Duchesne, Emery, Garfield, Iron, Millard, Piute, Sanpete, Sevier, Uintah, Washington and Wayne (Marked with an X on second map). A total of 3,376 subscribers will be affected by the move, effective Feb. 29, Semerad writes. Utah Media Group told readers, "This has been a very difficult business decision. Our goal is to continue to provide Utahns with the best possible news and information in the most efficient way." Tribune editor and publisher Terry Orme called the circulation cuts "an unfortunate reality of the problems that print media is facing right now."